A man sorts waste in Nicaragua. Photo by Libby McDonald. A team of seven MIT students from various disciplines will assemble on Nicaragua on January 7th to conduct a waste management analysis for five municipalities in the Region Autonoma del Atlantic Sur (RAAS). The five municipalities include Bluefields, Rama, Pearl Lagoon, Kukra Hill, and Corn Island. CoLab’s staff and project leader Libby McDonald, along with three graduate students, have already arrived. The MIT group and the representatives from the municipality in Nicaragua have been preparing for this analysis for months. They have met in-person and over the phone to design a useful project. The students formed a study group, completed a set of readings and went on field trips to local recycling facilities and other relevant waste management businesses. • design an awareness campaign so that the sorting of garbage can occur at the household level. The project goal is to support a collaboration between five municipalities in the design of a sustainable approach to waste management and recycling that simultaneously decreases green house gas emissions and generates income through enterprise development. Deare, Carmen Diana. Rural Social Movements in Latin America: Organizing for Sustainable Livelihoods. Vilas, Carlos M., Butler, Judy (translator). The Sandinista Revolution: National Liberation and Social Transformation in Central America. Bella, Gioconda. The Country Under My Skin: A Memoir of Love and War. “The Atlantic Coast of Nicaragua: Development and Autonomy.” Journal of Latin American Studies, Peter Sollis, January, 1989. Readings from Brunnegger, Sandra (2007). From Conflict to Autonomy in Nicaragua: Lessons Learnt. London: Minority Rights Group International. The Minority Rights Group has done much work on the issues of indigenous groups in the region. Manual on Municipal Solid Waste Integrated Management in Latin American and Caribbean Cities. José Henrique Penido Monteiro …[et al]; updated and adapted by Gilson Leite Mansur and José Henrique Penido Monteiro. Guest speaker via Skype: Lakshmi Narayan, General Secretary of the Pune, India waste picking union, Kagad kach Patra Kashtakari Panchayat. Medina, Martin, The World’s Scavengers: Salvaging for Sustainable Consumption and Production. Samson, Melanie, Refusing to be Cast Aside: Waste Pickers Organizing Around the World. Medina, Martin. 2005. “Waste Picker Cooperatives in Developing Countries.” Paper prepared for WIEGO/ Cornell/ SEWA Conference on Membership-Based Organizations of the Poor, Ahmedabad, India, January 2005. Dias, Sonia Maria. “Integrating Waste Pickers for Sustainable Recycling. Superintendency of Public Cleansing: Planning for Sustainable Integrated Solid Waste Management,” CWG (spell out) Workshop, 2000. Wilson, David C., Velis, Costas, Cheeseman, Chris. “Role of Informal Sector Recycling in Waste Management in Developing Countries, 2006. Achankeng, Eric. “Globalization, Urbanization and Municipal Solid Waste Management in Africa,” 2003. Chintan Environmental Research and Action Group. “Cooling Agents: An Analysis of Climate Change Mitigation by the Informal Recycling Sector in India,” 2009. Carrasco, Christine H. “Waste Pickers, Scavengers or Catadores: Conceptualizing “ASMARE” as a Comprehensive and Health Promoting Community Initiative in Brazil,” 2009. Medina, Martin. “Informal Trans-border Recycling on the U.S.-Mexico Border: The Cartoneros of Nuevo Laredo. (Delivered at the 1998 meeting of the Latin American Studies Association, 1998). Medina, Martin. 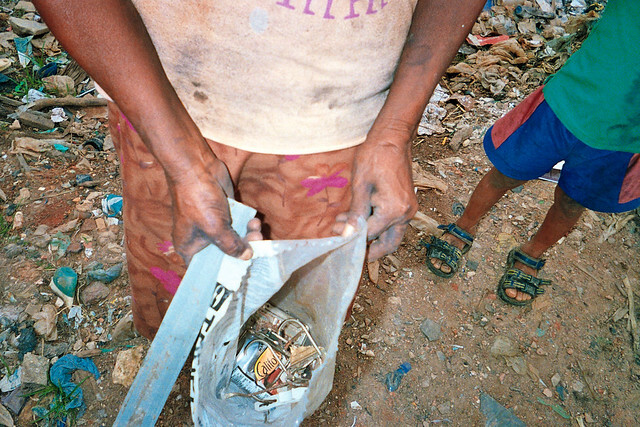 “Serving the Unserved: Informal Refuse Collection in Mexico,” 2005. Fieldtrips to: Vegiwatt, Green Grease Monkey, IST Energy, Save that Stuff, Northeast Biodiesel. Research enterprise models via Internet searches and Skype calls to partner waste picker unions in Pune, India, Bogota, Sao Paulo, and Mumbai. Each student was assigned two to three waste picking groups to contact and investigate enterprise models implemented within cooperatives. Each student came prepared to discuss three-four enterprise models, including a discussion of technology and business plans. This post is part of the Designing a Waste Management Strategy in Coastal Nicaragua series.